We’re blessed in Scotland to walk into any supermarket and face a healthy range of single malts for sale. It’s difficult not to become lost amidst the selection at some of the larger retailers although few options exist when you are looking for more than the standard bottling from a distillery. An example would be the search for 18 year or ever further up the whisky trail, for these you’ll need to jump online or visit a specialist retailer, if you’re unfortunately not living nearby a distillery. So what do you do when confronted by the whisky isle? Well, avoid the blends for a starter and place yourself in the single malt selection. Normally perceived to be the domain of those with money, it’s not the case in the major supermarket chains nowadays. The recent Burns celebrations sparked a marvellous price war where you could pick up the delightful Highland Park 12 year old malt for £24; an absolute steal and a great whisky to start with. Spending just a touch more will deliver far more flavour and rewards in the long term! 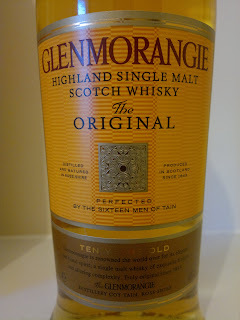 The whisky I’m focusing on this time is the staple Glenmorangie 10 year old malt with is distinctive golden packaging. Indeed, it is a treasure worth seeking out and for someone searching for a whisky to start their appreciation of the malts; a fine berth. Now an example of the price wars I picked up this little beauty for £20, and that’s the 70cl bottle. 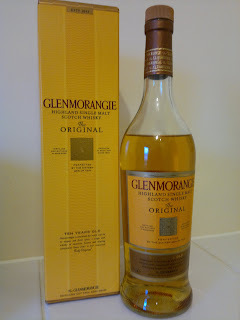 This original Glenmorangie also comes in a smaller and larger bottling but I’m a sucker for tradition. The distillery located in Tain is noted nowadays for trying a wide range of finishes and different editions as it spreads out from its original malt. However sometimes the original is the best of the bunch and I’m always satisfied by the ten year release. You can have your sherry finishes and fancy colouring if you please, but here is the iconic Glenmorangie. Established in 1843 I have some family connections with the distillery and it’s one of several worthwhile destinations if you have the pleasure of visiting Tain and the surrounding area. Balblair for instance is nearby, which is another favourite of mine. And I'll be continuing my distillery visits in 2012 so watch out for these. This is a fine, fresh and vibrant malt with a sweet honey and vanilla taste that sparkles on the taste buds with a level of complexity that is beyond it years, and when that’s over with it leaves an approving finish. Satisfaction is guaranteed here and it represents one of the best 10 year editions on the market. Dram fine!